A Story of Trust, Belief and Faith. Adaptation based on Sakrapani Boiragi. The flow of the river in Tembuwani from the Mighty Brahmaputra destroyed the crops and livelihood of the locals living there. This disrupted the lives of the people, who faced a lot of torment in the hands of the river. 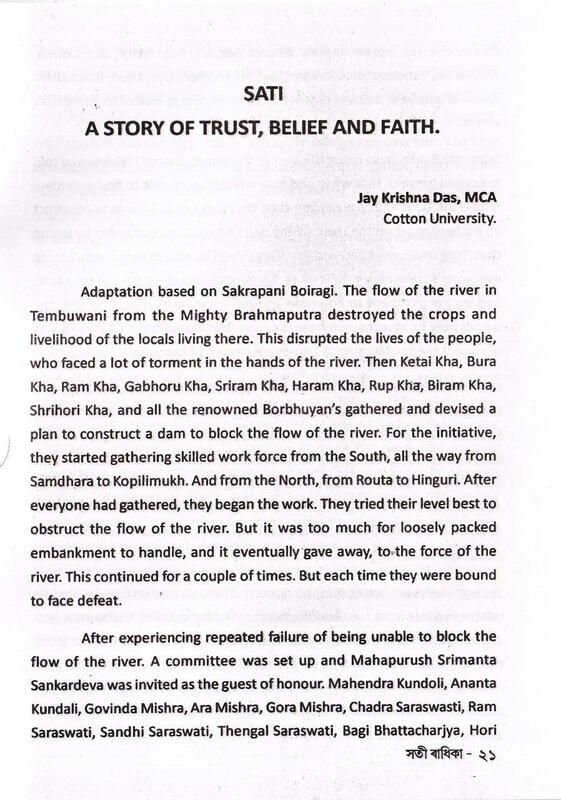 Then Ketai Kha, Bura Kha, Ram Kha, Gabhoru Kha, Sriram Kha, Haram Kha, Rup Kha, Biram Kha, Shrihori Kha, and all the renowned Borbhuyan’s gathered and devised a plan to construct a dam to block the flow of the river. For the initiative, they started gathering skilled work force from the South, all the way from Samdhara to Kopilimukh. And from the North, from Routa to Hinguri. After everyone had gathered, they began the work. They tried their level best to obstruct the flow of the river. But it was too much for loosely packed embankment to handle, and it eventually gave away, to the force of the river. This continued for a couple of times. But each time they were bound to face defeat. After experiencing repeated failure of being unable to block the flow of the river. A committee was set up and Mahapurush Srimanta Sankardeva was invited as the guest of honour. 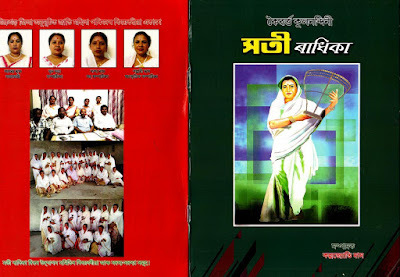 Mahendra Kundoli, Ananta Kundali, Govinda Mishra, Ara Mishra, Gora Mishra, Chadra Saraswasti, Ram Saraswati, Sandhi Saraswati, Thengal Saraswati, Bagi Bhattacharjya, Hori Bhattacharjya, Tarka Bagikh, Bhanu Bagikh, Kobiratna, Bidyaratna, Hemratna, Pancharatna, Chandrakhori, Surjyakhori, Bijoykhori, Ratnakhori, Ratna Bharati and many renowned Pandits were also invited to share their views. Srimanta Sankardeva being the host of the event, shared his view and told everyone present, that when and only when they’re able to find a woman, who is Sati (One who is pure) only then that they would be able to construct an embankment on the river. All the married couples responded by saying that their wives were Sati and that they would be able to help them. Seeing everyone’s claim about their wives. 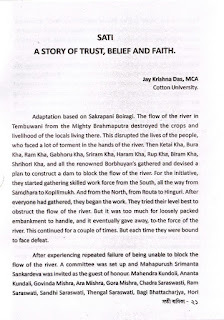 Srimanta Sankardeva gave them a task, and instructed them to go home and tell their wives that, only the one who is able to collect water from the river Brahmaputra with a Polo (A sort of basket made of bamboo), can prove herself of being Sati. Reaching home each man told his wife regarding the misfortune they were facing and that only a woman who is Sati, can help them in their ordeal. Each of their wives responded by boastfully claiming their right of being Sati, and set out to complete the task given to them. But none were able to do it. They exclaimed that it was impossible to bring water in a polo. Being disheartened all the men returned the very next day, and showed grimace of their claims about their wives, and how they reacted after being told about the task. Seeing everyone’s utter disappointment. Srimanta Sankardev decided to tell them a tale from the Skondha Puran, of a king in Kalinga, who once had an immense headache, and was suffering badly, so much that he declared that whoever is be able to cure him would receive half of his kingdom as reward. Hearing this many renowned doctors from near and far gathered in the kingdom and provided their remedy to the king. But all went in vain and none were able to do anything. Seeing their failure to cure him. The King captured and imprisoned all of them. Days passed, but no one was able to cure the king, slowly his agitation began to grow. After a few days, a hermit entered the courtroom of the King, and said that only when the king gives his word, that he wouldn’t imprison him like the rest, that he would be able to examine him. The king agreed, and the hermit examined him. He told the king that, only the milk from a woman who is Sati, can cure him. Hearing this, the king’s Rajguru responded that “I have a wife who is Sati”, and that if his king permits him, he can bring her. On being granted permission, he runs towards home. On seeing him running across the streets. Many people enquired where he was going, to which his only response was that he was bringing a woman who was a sati to cure the king. On hearing this one of the passer-by told him that when he had reached home, he should to wait at the porch of the house with his face faced down and not enter, nor should he speak to anyone except his wife, and only when his wife calls him, that he should go and tell her about the king’s situation, that for his cure the milk of a women who has had over 100 husbands is required. He agreed and just like he was instructed sat near the entrance of the house. He didn’t respond to neither his brother nor son’s calls. It’s only when his wife called him that he entered the house. And told her about his task of providing the king with the milk a woman who has had physical relations with over a hundred men. Being unaware of her husband’s intentions, she told him that she only required to have relation with just one more man to complete a hundred, which she could easily do so by doing to her daily run to the river. Hearing this the Rajguru was left dumbstruck. He couldn’t believe that all this while he was living with a woman like this, who destroyed his years of practicing Brahmanism in a split of a second. He was in disdain, he felt cheated and couldn’t live like this. He felt that this should would soon destroy him and eat his soul. He self-exiled him into the woods, where he spent the rest of his life in solitude. 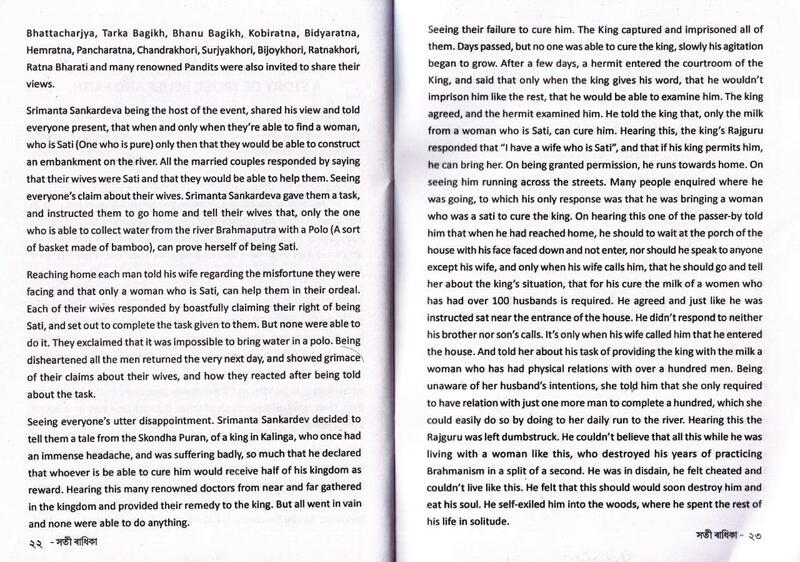 Srimanta Sankardev told them that they were also facing the same situation, that was mentioned in the Skondha Puran. Hearing this all the married man bowed their heads in shame. During the same time, a fisherman by the name of Purnananda was travelling with his wife Jugomaya across the river. Another name for Jugomaya was Radhika. She inquired about the gathering near the river to which Purnananda told her, that the Borbhuyans were searching for a woman who was a Sati, to help them build a dam on the river, as they were facing a lot of trouble. Hearing this Jugomaya claimed that she too was a Sati. 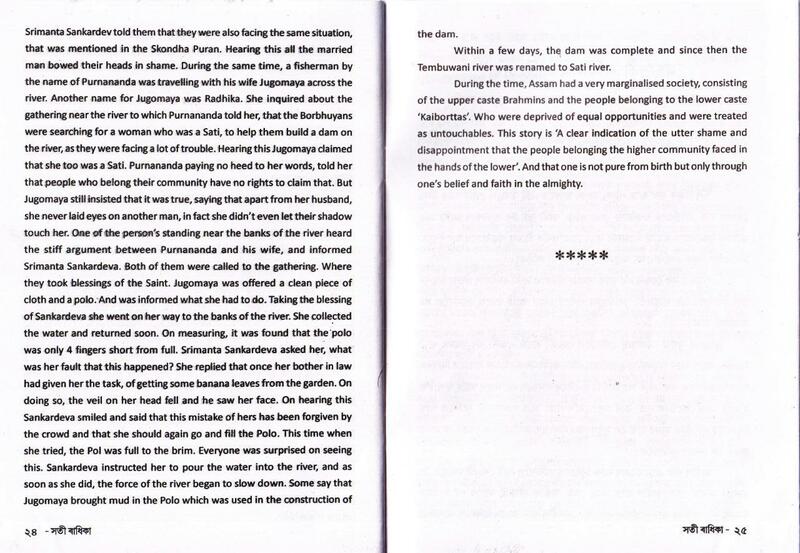 Purnananda paying no heed to her words, told her that people who belong their community have no rights to claim that. But Jugomaya still insisted that it was true, saying that apart from her husband, she never laid eyes on another man, in fact she didn’t even let their shadow touch her. One of the person’s standing near the banks of the river heard the stiff argument between Purnananda and his wife, and informed Srimanta Sankardeva. Both of them were called to the gathering. Where they took blessings of the Saint. Jugomaya was offered a clean piece of cloth and a polo. And was informed what she had to do. Taking the blessing of Sankardeva she went on her way to the banks of the river. She collected the water and returned soon. On measuring, it was found that the polo was only 4 fingers short from full. Srimanta Sankardeva asked her, what was her fault that this happened? She replied that once her bother in law had given her the task, of getting some banana leaves from the garden. On doing so, the veil on her head fell and he saw her face. On hearing this Sankardeva smiled and said that this mistake of hers has been forgiven by the crowd and that she should again go and fill the Polo. This time when she tried, the Polo was full to the brim. Everyone was surprised on seeing this. Sankardeva instructed her to pour the water into the river, and as soon as she did, the force of the river began to calm down. Some say that Jugomaya brought mud in the Polo which was used in the construction of the dam. Within a few days, the dam was complete and since then the Tembuwani river was renamed to Sati river. During the time, Assam had a very marginalised society, consisting of the upper caste Brahmins and the people belonging to the lower caste Koibortas. Who were deprived of equal opportunities and were treated as untouchables. This story is ‘A clear indication of the utter shame and disappointment that the people belonging the higher community faced in the hands of the lower’. And that one is not pure from birth but only through one’s belief and faith in the almighty. The above article has been published in the 1st ever edition of 'Sati Radhika' annual magazine by the Assam Anususit Jaati Mahila Parishad in association with Dibrugarh District Anususit Jaati Mahila Parishad on the occasion of 'Sati Radhika Divas'. The article is it's one of a kind on the internet till date. If you found the article helpful or have any valuable feedback then please comment below and we will get back to you as soon as we can. Lastly like share and subscribe to us , its encouragement that keeps us going :).